Click Here (26.6 MB) for your high resolution copy in PDF format. It is best to download the document and view it outside of a web browser with Adobe Acrobat to get the full color and the interactivity of the document. Also, if your web browser is Firefox, please clear private data before downloading. Note: with the many links in the document, the external hyperlinks may be slow to load and if Adobe Acrobat hangs, then re-boot your computer and that should fix the problem. Click Here (12.8 MB) for your low resolution copy in PDF format. All files open in a new window. For best results, download the document: In the upper, right-hand corner of the page, click the Download button. Click the downloaded file to view, print or save. Click Here (65.3 MB) for your high resolution copy in PDF format. It is best to download the document and view it outside of a web browser with Adobe Acrobat to get the full color and the interactivity of the document. Also, if your web browser is Firefox, please clear private data before downloading. Note: with the many links in the document, the external hyperlinks may be slow to load and if Adobe Acrobat hangs, then re-boot your computer and that should fix the problem. Click Here (53 MB) for your low resolution copy in PDF format. All files open in a new window. For best results, download the document: In the upper, right-hand corner of the page, click the Download button. Click the downloaded file to view, print or save. Click Here (58 MB) for your high resolution copy in PDF format. It is best to download the document and view it outside of a web browser with Adobe Acrobat to get the full color and the interactivity of the document. Also, if your web browser is Firefox, please clear private data before downloading. Note: with the many links in the document, the external hyperlinks may be slow to load and if Adobe Acrobat hangs, then re-boot your computer and that should fix the problem. Click Here (28.8 MB) for your low resolution copy in PDF format. All files open in a new window. For best results, download the document: In the upper, right-hand corner of the page, click the Download button. Click the downloaded file to view, print or save. Click Here (67.1 MB) for your high resolution copy in PDF format. It is best to download the document and view it outside of a web browser with Adobe Acrobat to get the full color and the interactivity of the document. Also, if your web browser is Firefox, please clear private data before downloading. Note: with the many links in the document, the external hyperlinks may be slow to load and if Adobe Acrobat hangs, then re-boot your computer and that should fix the problem. Click Here (32.4 MB) for your low resolution copy in PDF format. All files open in a new window. For best results, download the document: In the upper, right-hand corner of the page, click the Download button. Click the downloaded file to view, print or save. Continuing a series of publications on issues of sustainability for US/Canada and globally, the August issue of EEGS Technical Magazine FastTIMES, Vol 23, 3 is a Special Issue on Infrastructure: Dams and Levees, featuring five case histories illustrating the application and benefits of using geophysics to assist in dam and levee safety, condition assessment and geotechnical investigations. The Special Issue is intended to raise awareness of geophysical methods and benefits and limitations, in the dams and levees professional community. 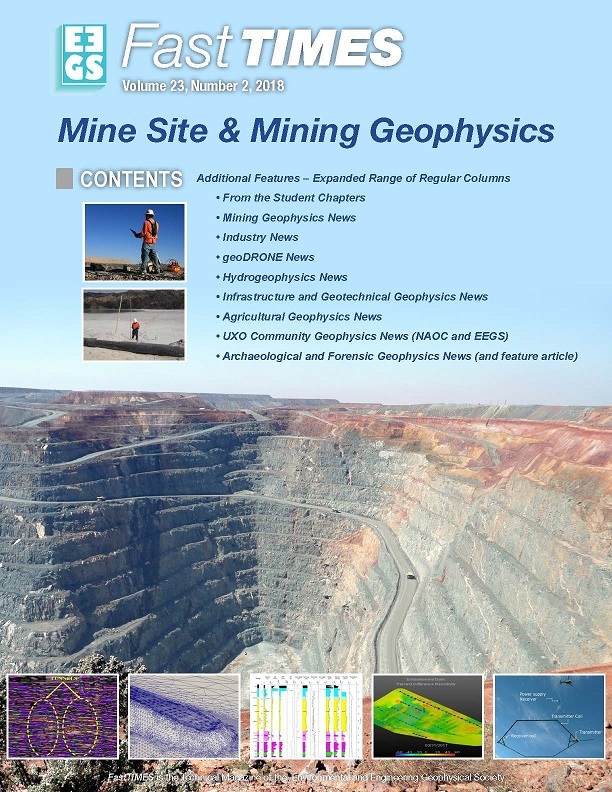 Vol 23, 3 and all previous Special Issues (in high and low resolution interactive pdf format) are freely available for download by near-surface geophysics practitioners and end-users of geophysics (engineers, geologists and managers), in both high and low resolution versions, from http://www.eegs.org/latest-issue. 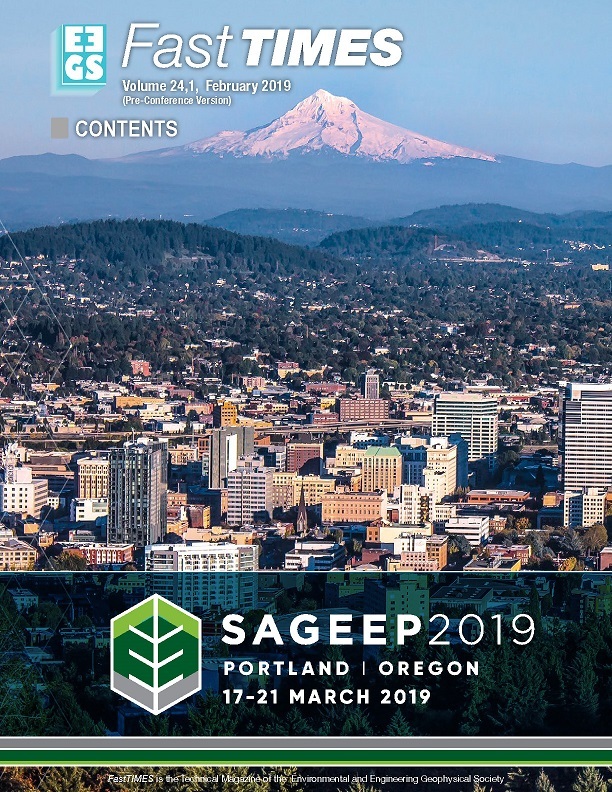 Additional features in FastTIMES, Vol 23, 3 are firstly, the Call for Abstracts for SAGEEP 2019, the EEGS Annual Conference, to be held in Portland Oregon. Deadline for Abstracts is December 2, 2018. SAGEEP 2019 will be delivered with the assistance of EAGE and feature a three-parallel conference format including the traditional SAGEEP and parallel conferences on Geohazards and also Shallow Marine and Coastal Geophysics. Secondly, there are the regular columns including a new regular column combining Hydrogeophysics and Environmental Geophysics News, which features, as part of EEGS sponsorship in kind of the 5th International Workshop on Induced Polarization, to be held at Rutgers University early October, the Full Workshop Program. In October FastTIMES we feature the Workshop full abstracts. In the Infrastructure and Geotechnical Geophysics News Column, there is a general discussion on Dams and Levees and it points to resources for guidance in approaching dam and levee safety. 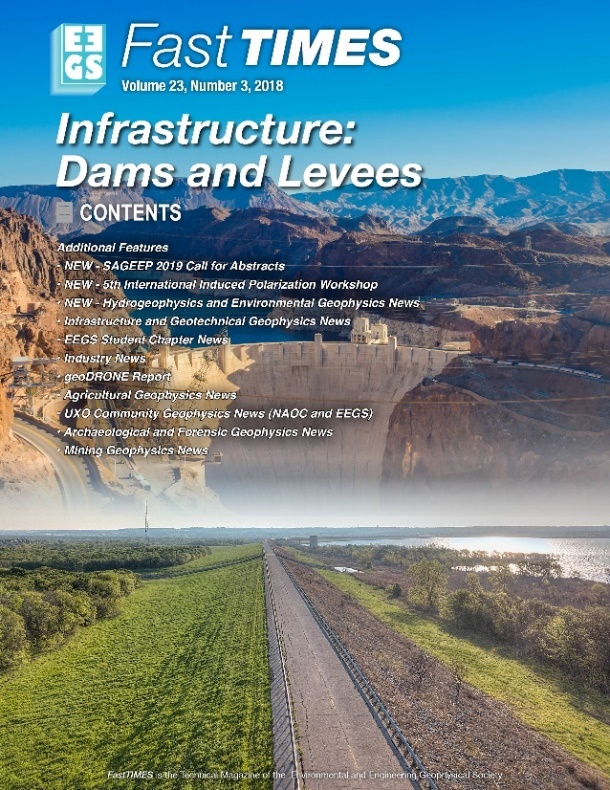 There are three geophysical case history articles on application of geophysics to dams and two on levees in this Special Issue and we hope many more in the coming issues of the Infrastructure and Geotechnical Geophysics News Column. 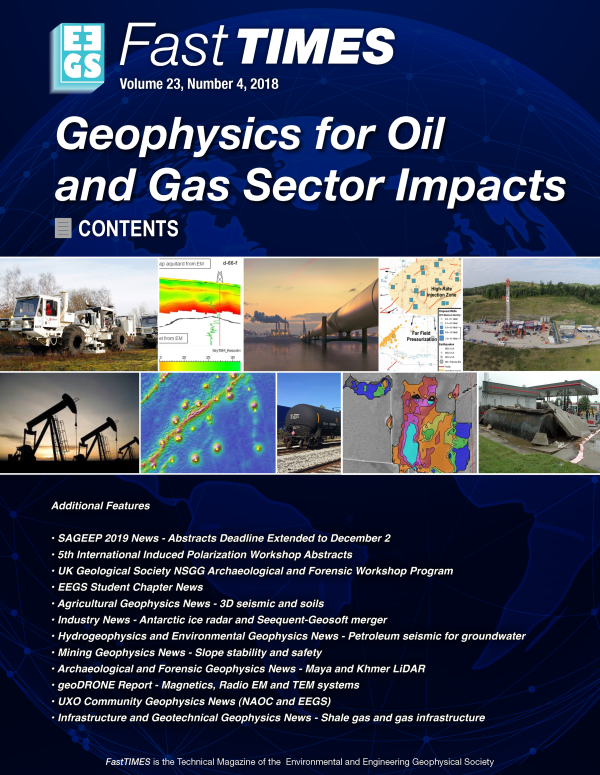 We appreciate the support of AEG, USSD, IAEG and Geological Society (UK) Near-Surface Geophysics Group who advertise their activities in the Special Issue and are assisting in publicizing this Special Issue to geologists and engineers. 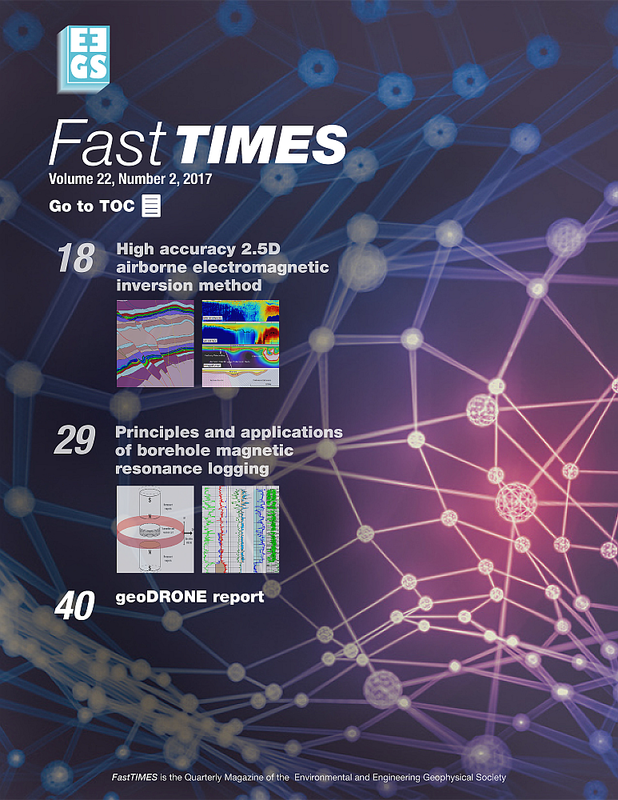 Learn more about upcoming issues of FastTIMES in 2018 at http://www.eegs.org/latest-issue. 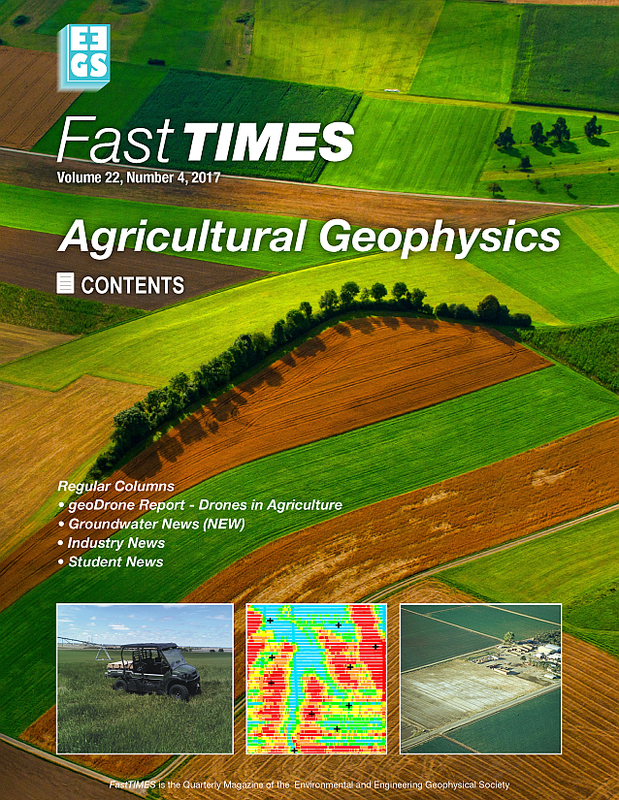 For upcoming FastTIMES editions if you have a near surface geophysics related news item, a story to tell or a case example and would like your article or news item to reach a wider audience than NSG geophysicist practitioners, please contact FastTIMES Editor, Geoff Pettifer ([email protected]). Click Here (84 MB) for your high resolution copy in PDF format. It is best to download the document and view it outside of a web browser with Adobe Acrobat to get the full color and the interactivity of the document. Also, if your web browser is Firefox, please clear private data before downloading. Note: with the many links in the document, the external hyperlinks may be slow to load and if Adobe Acrobat hangs, then re-boot your computer and that should fix the problem. Click Here (67.7 MB) for your low resolution copy in PDF format. All files open in a new window. For best results, download the document: In the upper, right-hand corner of the page, click the Download button. Click the downloaded file to view, print or save. 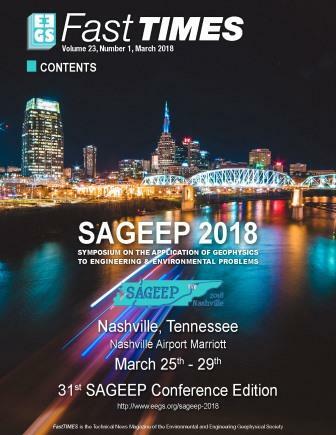 This special edition has a detailed description of: the SAGEEP 2018 technical program and total experience, for convenient future reference and access, with complete short Abstracts, Extended Abstracts, the short courses, the field trips, the keynote address, the Geoscientists Without Borders® luncheon, the Special Event EEGS luncheon, the exhibitor and sponsor lists, the important EEGS Foundation on line auction fund raising event (https://www.eegsfoundation.org/on-line-auction), the great social program planned, plus details of the Conference venue and what to do in Nashville and what Nashville has to offer. Photos from the Conference events are included also. Click Here (76.6 MB) for your high resolution copy in PDF format. It is best to download the document and view it outside of a web browser with Adobe Acrobat to get the full color and the interactivity of the document. Also, if your web browser is Firefox, please clear private data before downloading. Note: with the many links in the document, the external hyperlinks may be slow to load and if Adobe Acrobat hangs, then re-boot your computer and that should fix the problem. Click Here (38.1.7 MB) for your low resolution copy in PDF format. All files open in a new window. For best results, download the document: In the upper, right-hand corner of the page, click the Download button. Click the downloaded file to view, print or save. Click Here (198.8 MB) for your high resolution copy in PDF format. All files open in a new window. For best results, download the document: In the upper, right-hand corner of the page, click the Download button. Click the downloaded file to view, print or save. You need the free Adobe Acrobat Reader to open these files. Follow FastTIMES on Twitter @EEGS_FT. Click Here (82.7 MB) for your low resolution copy in PDF format. All files open in a new window. For best results, download the document: In the upper, right-hand corner of the page, click the Download button. Click the downloaded file to view, print or save. 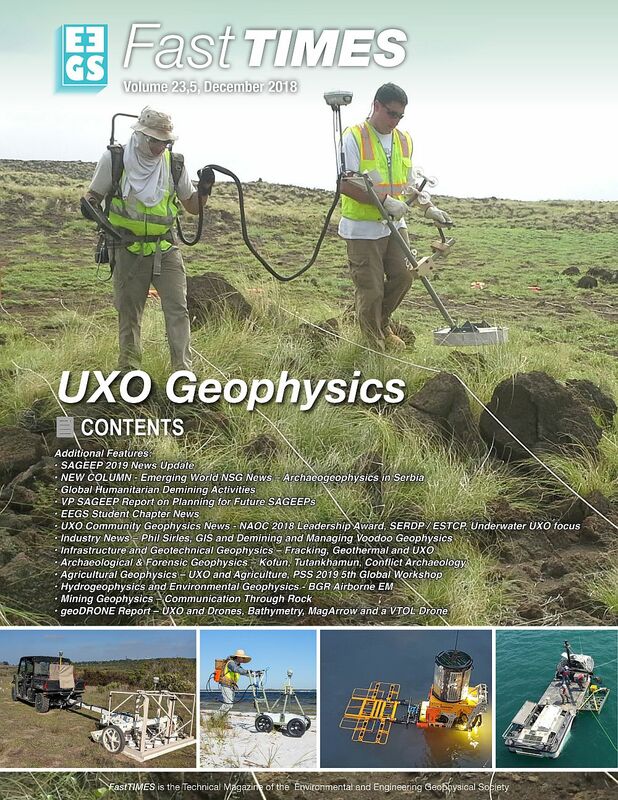 The EEGS staff is pleased to publish the latest issue of FastTIMES, (ISSN 1943-6505), news for the near-surface geophysical sciences. Past issues are also available online. Click Here (267 MB) for your high resolution copy in PDF format. All files open in a new window. For best results, download the document: In the upper, right-hand corner of the page, click the Download button. Click the downloaded file to view, print or save. You need the free Adobe Acrobat Reader to open these files. Follow FastTIMES on Twitter @EEGS_FT. Click Here (126 MB) for your low resolution copy in PDF format. All files open in a new window. For best results, download the document: In the upper, right-hand corner of the page, click the Download button. Click the downloaded file to view, print or save. Click Here (63 MB) for your high resolution copy in PDF format. All files open in a new window. For best results, download the document: In the upper, right-hand corner of the page, click the Download button. Click the downloaded file to view, print or save. You need the free Adobe Acrobat Reader to open these files. Follow FastTIMES on Twitter @EEGS_FT. Click Here (35 MB) for your low resolution copy in PDF format. All files open in a new window. For best results, download the document: In the upper, right-hand corner of the page, click the Download button. Click the downloaded file to view, print or save. 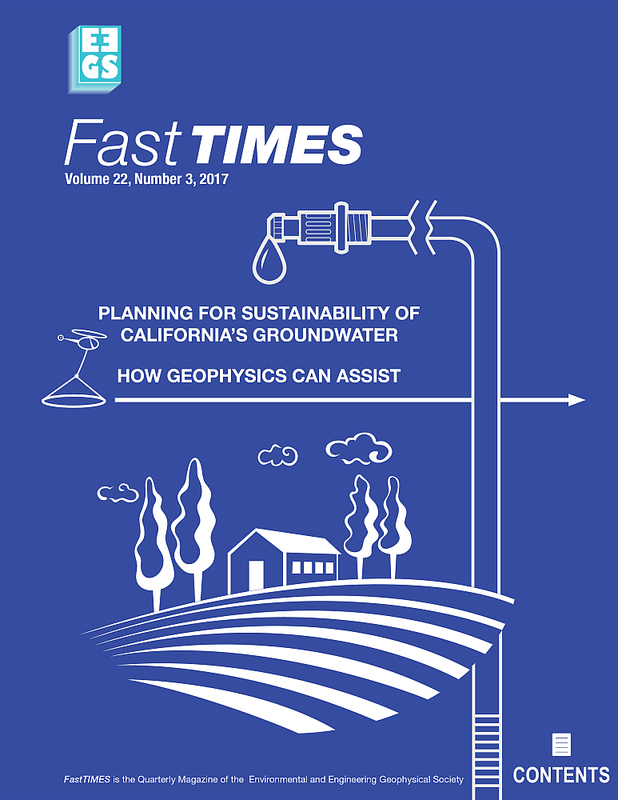 The editorial team FastTIMES, EEGS's online (and freely downloadable) magazine for near-surface geophysics, welcome comments and suggestions and technical article contributions and is looking for new members, to join our Editorial team particularly as Guest Editors or Regular Columnists. • Regular Columnists Ron Bell ([email protected]) for Drone Geophysics; Angelos Lampousis ([email protected]) for Agricultural Geophysics; Jeff Leberfinger ([email protected]) for UXO News; Nick Duda ([email protected]) for Student Chapter News and Geoff Pettifer ([email protected]) for Groundwater News and Industry News. To encourage greater advertising of large and small consulting, contracting and equipment/software companies as well as academics to our expanding geoscience community of readers, attracted by the growing broader relevance and appeal of FastTIMES to the wider geoscience community, the Professional Directory (Business Card Advertisement size). Advertising Rates have been reduced to $55 for a single issue or $50 / issue for all remaining 2018 FastTIMES issues. These discount rates for Business Cards are across the board for all membership / sponsor categories. Discounts for academic institution advertising have been added to already existing Corporate Member and regular advertiser discounts for larger advertisements. For further details on the new advertising rates and how to take advantage of these, please check http://www.eegs.org/advertising-information. Advertising inquiries should be sent to Jackie Jacoby ([email protected]). To take full advantage of the electronic format, utilize the hyperlinks within the document that link the table of contents with articles, the advertisers with their ads, the authors and their email addresses, and the advertisers and articles with the appropriate external websites. We encourage expanding FastTIMES distribution to the widest possible audience. If you know of someone or a geoscience society or organisation that might enjoy or benefit from regularly reading FastTIMES but may not be on the distribution list, feel free to email the web link to them and advise Jackie Jacoby ([email protected]) to add them to the mailing list.